Andrew: Hello readers! We're about a week late on this review, and for that we apologize, but it's such a busy time for us at our day jobs and with so many big movies coming out this summer it's been tough to keep up with it all! Alas, we decided to take some quick time and do this particular review the old fashioned way - via email! Last Saturday we were able to catch an IMAX 3D showing of Guillermo del Toro's new sci-fi/action flick Pacific Rim, a passion project of his about gigantic aliens called Kaiju (pronounced how it looks like) that arrive on our planet through a chasm in the Pacific Ocean and begin to destroy cities around the world and how humanity is fighting back with gigantic robots called Jaegers (pronounced "yay-gers") that, as Wikipedia so eloquently puts it, are "massive, humanoid fighting machines...which are controlled simultaneously by two pilots whose minds are bound in a neural link which lets them share the mental strain which would otherwise overwhelm a single pilot." Got it? Good! So Sarah, I know this was a film I was very much looking forward to seeing because I'm a big fan of del Toro's work and because the idea just sounded so freaking awesome. Where you as excited to see it as I was? 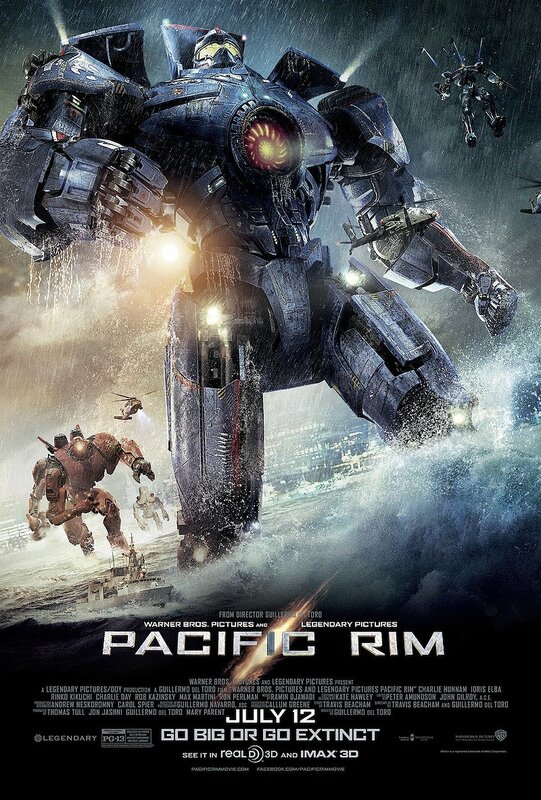 And now that we've seen it, what did you think of Pacific Rim? Sarah: I was excited to see this one on the big screen, but I gotta say, I think I went into it with too high of expectations. I think that I was expecting it to be awesome visually AND awesome acting, too, and that's where I think I missed the point. It was stunning from a visual aspect. That said, I thought that the Kaijus and the Jaegers were so freaking cool and I thought that their battles were pretty epic! The tearing apart of Tokyo was something to really be appreciated on a grand scale so in that respect I'm glad that we saw it on IMAX. But...from an acting standpoint, it was a little cringe-worthy! Idris Elba (Thor) was really the best actor in the movie and he carried the whole movie from that side of things. Charlie Hunnam (FX's Sons of Anarchy) on the other had was a little rough, His dry and emotionless delivery was pretty painful to watch. I I wish that Diego Klattenhoff (Showtime's Homeland) had been in the leading role instead. But again, I think I missed the point, it was supposed to be more about the visuals that anything else. A: I would definitely say that GDT was going more for visuals than anything else, and Hunnam wasn't ELECTRIC in the leading role, but I thought he was solid. I enjoyed following his character around. I do wish Klattenhoff had a bigger role, as I'm a fan of his work on Homeland, but his role was pretty integral to the story and he carried it well. Let's stick with the cast for right now before we tackle the plot and the giant monsters fighting giant robots. We're both relative fans of Idris Elba even though neither of us have seen what is apparently his best career work in The Wire and, more recently, on the BBC's Luther. But damn if I didn't absolutely love him in the role of Stacker Pentecost, the commander of the Jaegar program. He's just able to portray an incredible, strong leader with his voice and his eyes, I liked his father-son/father-daughter relationships with Hunnam's Raleigh and Rinko Kikuchi's Mako Mori, and that speech! Best part of the whole movie if you ask me. S: I did like that speech but I really wish that they hadn't given it away in the trailer. He really does a fantastic job of carrying it through the rest of the film. The father/daughter relationship carries through the movie really well and I love the focus on relationships between all the characters. The Jaeger program requires that the two pilots be extremely compatible and I like that they show different types of relationships in this movie: father/son, brothers, lovers, and then a team where both have both had extremely traumatic losses. I thought that the other teams brought some interesting layers to the story but other than that, they were killed off too fast to get invested in. A: Wholeheartedly agree with you that the other Jaeger pilots didn't get nearly enough screen-time. The movie does a good job of telling us and showing us that there's a history in this Jaeger program that was once very successful and had tens of Jaegers, but now they're losing the battle and they're only down to 4 teams of pilots. I would have liked to have seen more of the Russian team and the Chinese team, certainly, though I felt we got a good enough look at the Australian father-son tandem, Herc and Chuck Hansen. What did you think of Kikuchi's performance at Mako Mori? Personally I thought she did pretty well in the physical aspects of her role, but when she had to play assistant to Pentecost I thought her English-based performance faltered. S: I thought she was ok. She definitely had that Japanese/anime feel to her. Like they pulled her out of some Japanese karate movie. She didn't add a ton of emotion to the film and I really couldn't buy her and Hunnam's relationship. I felt like it was forced on us. But then again, I'm not sure that was the point of the film. I really think it was all about the action between the robots and aliens! The aliens in this movie were awesome in the sense of the word. If this actually happened, I don't know how people would actually respond, it would be so terrifying! They were just so huge! And I loved how they showed how people adapted particularly in using the massive carcasses of the monsters. Enter Ron Perlman (Hellboy). Selling black market Kaiju parts was a pretty cool little part of the movie that I also wish they'd shown more of. But I do love me some Ron Perlman and I think that he wasn't in Pacific Rim enough! I'm hoping they give him a bigger role in the next one! A: Those details about how humans have adapted to living with the constant Kaiju attacks was definitely one of my favorite things about the movie. I liked that Perlman's Hannibal Chau runs that black market thanks to a deal with Pentecost wherein Chau gets first dips at Kaiju carcasses. I liked that the world governments have decided that the Jaegers are failing, so the best way to defend their coastal cities is to build a gigantic wall, and we get to see that process happening from the inside (and I find it interesting that the wall doesn't work, seeing as it could be a commentary on the United State's immigration issues). More than anything though regarding details, I loved that GDT took the time to make each and every Jaeger and Kaiju unique, and that he gave the audience the chance to see ALL of his creations - rust, dents, warts and all. There's not much quick-cut editing in the fight scenes here. Instead GDT lovingly gives us pan shots to show the entirety of his monsters, and he uses wide shots in the fight scenes so we can actually see what's going on. THAT'S why the battles between the Kaiju and Jaegers were so impressive to me - GDT actually showed us the scope of the battles. We see them fighting in the ocean and standing tall, we see them fighting in between skyscrapers and rattling those buildings' windows as they walk past, we see everything...and on the big screen? That's awesome. S: I will give it that. While it was lacking in a lot of other areas, the massive shots of the fights were impressive. The different kinds of Kaijus were cool because they each had different fighting techniques that I thought was interesting. And while the Kaijus continues to adapt, the Jaegers really didn't which I think is why they were failing. All in all this film was fun on a grand scale, but as a character development story, I think it struggled. I might have been the only one that had a problem with this though. It wasn't a movie meant for in-depth thought, it was just a fun, summer blockbuster. In that respect, I think it was on the money. FINAL VERDICT: A must-see on the big screen!